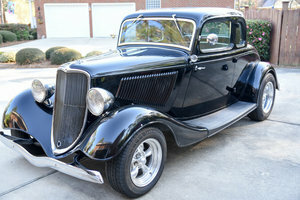 1933 Ford 5 Window Coupe Great Condition and Lots of Fun to Drive! All Steel \'33 Ford 5-Window Coupe --- Fast!!! \'32 Radiator Shell 350 cu./TH350 Transmission Ford 9\' Rear w/350 gears Wilwood Front Disc Brakes Electric Windows Crank Out Windshield Opening Cowl Vent Ceramic Coated Zoomies w/Removable Baffles Dual Edelbrocks 4bbl w/Highrise intake CD Player in Overhead Console Banjo Steering Wheel Beautiful Custom Interior Painted Satin Black in 2015 Flaming River Steering Box \'I Did It\' Steering Column w/Tilt Wheel New Starter 4 Bolt Main +300 hp Lokar Floor Shifter Built by Race Team in approx 2010 Please Note The Following **Vehicle Location is at our clients home and Not In Cadillac, Michigan. **We do have a showroom with about 25 cars that is by appointment only **Please Call First and talk to one of our reps at 231-468-2809 EXT 1 ** FREE Consignment Visit Our Site Today Easy To List Your Vehicle and Get it Sold in Record Time.